Busy as they are this time of year, Maine's hunting guides love stopping to spin a tale. Hunting season is not just about spending time in the woods, tracking deer and trying to bring home wild game meat. It’s about stories. And probably nobody has as many quirky or ridiculous stories of the woods as Registered Maine Guides. Dave Carey retired as a bear guide six years ago after a 35-year career. In those years at his hunting lodge outside Rangeley, Carey had seen a bull moose charge his truck, and a black bear chase a hunter and guide. But Carey’s favorite story was the time he made two Connecticut policemen who came to hunt bear believe they were on a much bigger hunt. The two men were avid Bigfoot fans so Carey took full advantage. He cut a piece of plywood in the shape of a giant foot and imprinted the footprints in the mud around the bait sites. He then got a bag of hair from the local barber and spread clumps of hair in the footprints. And on the logging road into the bait sites, Carey put up a sign alerting hunters there had been a Bigfoot sighting, and asking hunters with information to call the University of Washington. And then there are those who refuse to believe in the ordinary and everyday, like ocean tides. Every year without fail when Mike Andreotti of Brunswick guides sea duck hunters along the coast, at least one will be mystified by the tides. “Some people from the Midwest or Texas don’t know what to do with a 10-foot tide that drains in 51/2 hours. I get more laughs at it and I’m laughing with them,” Andreotti said. 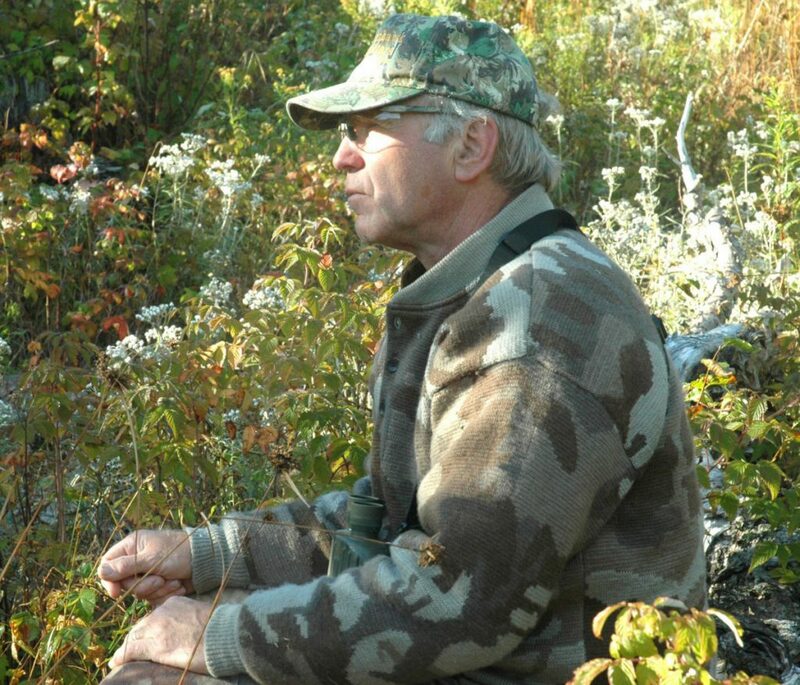 Roger Lambert started guiding people for moose when he was 18. Lambert has hosted the world moose calling championship and lectured on moose behavior at the North American Moose Conference. Suffice it to say, Lambert, now 71, knows moose. His favorite story is when he was scouting outside Rangeley for a friend and his son. He took them “up in the jungle on a mountain” and let loose a moose call to which a bull answered. But as that bull came toward them it stopped grunting, or “hung up on them,” as Lambert puts it. So Lambert gave a different call and heard in response a “super grunt” from another bull. Both moose were competing for the cow Lambert’s call imitated. As the second bull came plowing through the trees, it went to turn its antlers to get between two trees, but instead slammed one of them into a maple tree. “It spun him right around and he went down with his head sideways,” Lambert said. Then Lambert saw what he never forgot. At Wildwind Kennels in Knox, Jim Keller has been a Maine hunting guide for 20 years and a bird dog trainer for 32. He’s one of the nation’s top dog trainers with 98 field champion titles and a dog that was inducted into the National Bird Dog Field Trial Hall of Fame in Grand Junction, Tennessee. Keller has stories of lost hunters from his years of guiding, but one of his favorite stories is about a puppy. It was the time a retired DuPont executive came to Keller’s kennel to buy a bird dog. The man drove from Pennsylvania to his Rangeley camp and stopped on the way at Keller’s kennel in Knox. When he did, Keller was struck by his attention to detail. Not long after, the man returned to ask Keller to train his dog, but the puppy already had trained the man.